The Professional Regulation Commission released the September 2014 Electronics Engineering and Technician licensure board exam results, as we're expected on Thursday, October 2, 2014. PRC and the Board of Electronics Engineering announced the full list of passers together with the top 10 passers on their portal and we also put it here. PRC conducted the September 2014 ECE and ECT board exam in the designated testing centers in Manila, Baguio, Cebu, Davao, Iloilo and Lucena, it was held on Saturday and Sunday, September 27-28, 2014 for Electronics Engineering and Monday, September 29, 2014 for Electronics Technician. The Board of Electronics Engineering Chairman is Alnar L. Detalla and the members are: Herminio J. Orbe and Enrico Claro R. Delmoro. According to PRC, the September 2014 Electronics Engineer (ECE) board exam covers the following subjects: Mathematics, Electronics Engineering, General Engineering and Applied Sciences (GEAS), and Electronics Systems and Technologies (EST). For Electronics Technician board exam include Basic Mathematics, Electronic and Electrical Equipment, Philippine Electronics Code and Electronics Engineering Law of 2004. PRC usually released the exam results within 3-working days after the last day of exam. Based on the previous exams, expect the results around 7:30pm to 9:30pm to become available online. Last March 2014, the results was posted on PRC portal in three (3) working days after the last day of examinations. They released a total of 907 out of 2,574 passed the Electronics Engineer Licensure Examination and 969 out of 1,488 passed the Electronics Technician Licensure Examination. 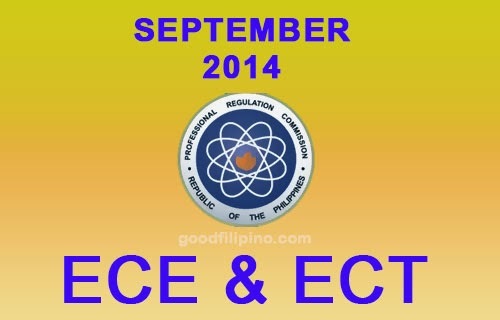 For more September 2014 ECE and ECT board exam results related information, kindly bookmark this page and share to your joined social networking sites. Comments or suggestions about "September 2014 Electronics Engineer (ECE) & Technician (ECT) List of Passers" is important to us, you may share it by using the comment box below.